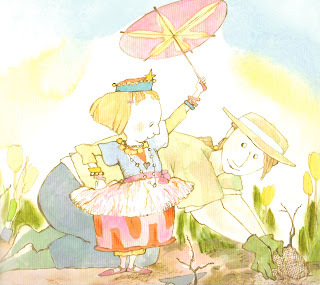 Before I say anything else about The Queen of France, I need to applaud Tim Wadham and Kady MacDonald Denton for creating a picture book character who can wear a tutu, be surrounded by pink things, be a bit imperious at times and not be the LEAST BIT like the Fancy-Pink-a-Pig-Princess-Ballerinas who are dominating the pages of so many picture books aimed at girls these days. 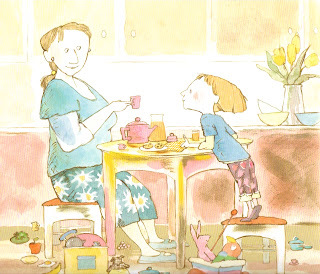 Despite initial appearances, I think you will find that Rose from The Queen of France has more in common with Maurice Sendak's Rosie, from The Sign on Rosie's Door (click here to hear Meryl Streep read this marvelous book at Sendak's 80th birthday) than she does with Pinkalicious, Fancy Nancy and Olivia. And to me, that is a very good thing. Perhaps this is why Rose is not encumbered by what popular culture currently portrays as girlhood: Tim Wadham, author of The Queen of France, is a librarian who has served on many prestigious awards committees and always had a passion for children's books. As he said in an interview, "Years of experience as a librarian reviewing materials and conducting story times kept me always on the watch for good books that read well aloud. I know that every word matters, especially in the short picture book text." 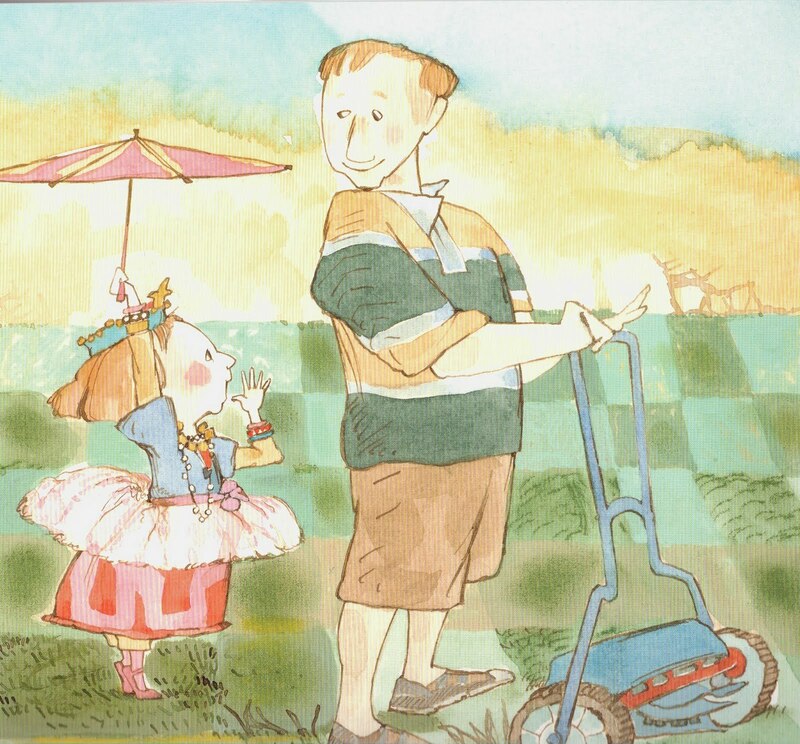 Also, Wadham has a daughter who's pretend play was the inspiration for his first book. His experience with children and this genre is obvious when you read his debut picture book The Queen of France, marvelously illustrated by Kady MacDonald Denton, who is best known for illustrating Bonnie Becker's Bear books, A Visitor for Bear, Bedtime for Bear and A Birthday for Bear. Wadham captures the improvisational style of play that kids are so good at while also presenting matter-of-fact parents who know how to role play as well as what role to play in a story that is involved enough to keep older listeners rapt from the first page to the last. Please note - my scanner has washed the colors out of the illustrations and they are much more vibrant than what you see here. The Queen of France begins, "When Rose woke up that morning, she felt royal." A trip to the marvelous "make-believe basket" of dress-up clothes and costume jewelry (clearly not the type manufactured specifically to be costumes, but what is most likely a collection of mom and grandma's hand-me-downs) results in the transformation from Rose to the Queen of France. What makes this more than just a dress-up-pretend story is Rose. 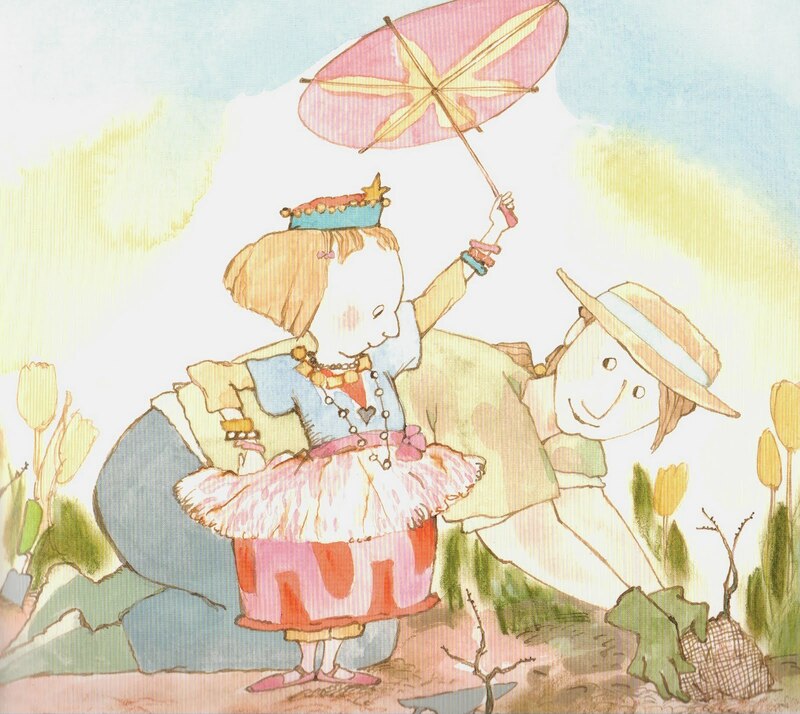 She heads into the garden where her mother is planting bare-root roses and says, "Hello, I am the Queen of France. Have you seen Rose?" After a brief discussion with her mother, the Queen of France pricks her royal finger on a thorn and heads off to find the Royal Physician to tend to her. When she finds her father mowing the lawn but no Royal Physician, she asks him if he has seen Rose. When he answers, "No. I thought she was in the garden. When you see her, please tell her we are reading an exciting pirate story tonight," the Queen goes inside to disrobe and Rose bandages her own finger. 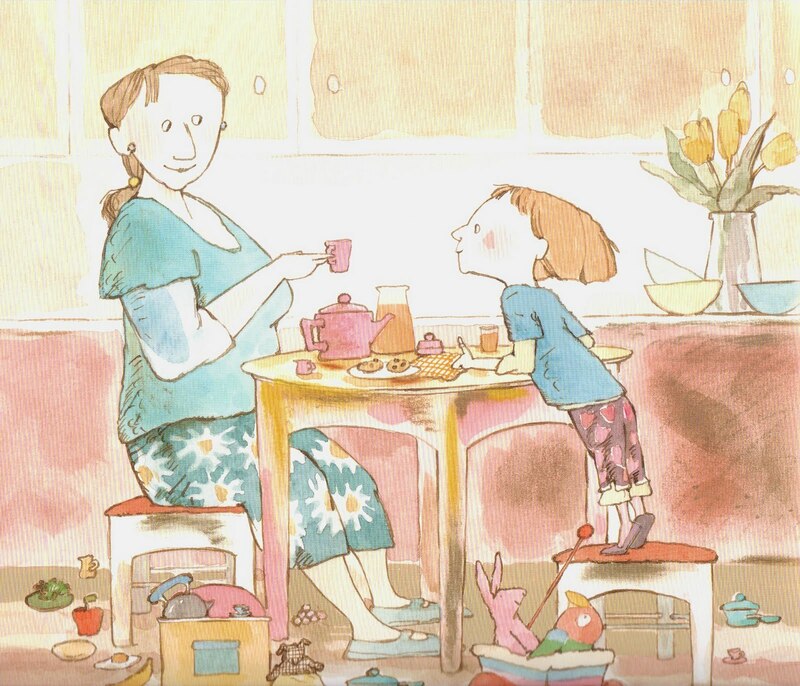 Then Rose decides to ask her mother if she has seen the Queen of France. She has not, but she reminds Rose to clean her room, which she does without fuss. Then, the Queen decides to make another appearance. After telling her mother that she is "shocked that she does her own cooking," the Queen asks if she can convey a message to Rose. The Queen wants to trade places with Rose. She is tired of being Queen and wants to be a daughter. Rose can be Queen. "You Majesty, I am sure Rose would love that," answers her mother. But first, Rose's mother wants to know who will read to her at the castle and who will kiss her better when she is hurt? The Queen assures her that she will have many servants to take care of her and her mother responds, "Well then, I suppose she will be fine. Her father and I will miss her very much." When the Queen wants to know just how much Rose will be missed, her mother answers, "I will miss her infinity times infinity." The causes the Queen to reconsider the swap, saying, "If you would miss her that much, I'm afraid we cannot change places. Rose would have liked being queen, though. You never have to clean your own room." The Queen leaves and Rose returns to hugs and kisses from her mother and father. The final lines of the book read, "When Rose finisheddinner that evening, she felt scary."